A new book written by our Managing Director Nicolas Seal, now available from Amazon for only £14.99. How a valuable plant in the East became the “root of evil” in the West. In this essential read for anyone affected by Japanese knotweed, leading industry expert Nicolas Seal traces the spread of the “root of evil” from its native habitat in Asia through Europe and into the UK, and explains why it is described as “indisputably the UK’s most aggressive and destructive plant”. Seal questions whether it deserves this fierce reputation, with a narrative that gives the facts without the scaremongering to show it may have significant value in the West as well. In this work, over 20 years’ experience have been distilled to create a beautifully illustrated and informative guide to this vital subject. An invaluable aid for anyone concerned about Japanese knotweed and its rampage across the UK, the book breaks down the myths, substantiates the facts and offers readers clear advice about what to do if their property is affected. 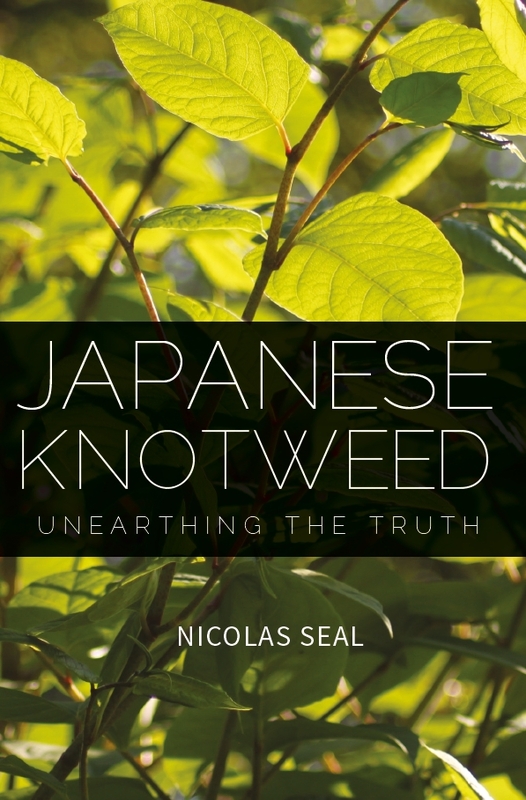 Nic is a PCA member with many years’ experience in knotweed management and has produced this book to explain how and why Japanese knotweed has spread so successfully from its native Asian habitats and also to “set the record straight” regarding many of the myths surrounding this remarkable plant. The book is beautifully illustrated with many original drawings by Lizzie Harper and superb photographs. It is a small paperback designed to be accessible to a wide readership – homeowners especially. The text follows a logical transition from ‘history’ to identification’ then on to some aspects of plant physiology before trying to explain why knotweed has become the scourge of homeowners, how the knotweed management sector has evolved, the different strategies used (with pros and cons) and “What to do if your land is affected by Japanese knotweed”. The book finishes with an interesting summary of all the ways in which Japanese knotweed has been put to commercial use over the years (from herbal medicine to food source) and poses the question whether, if knotweed can’t be controlled, we should conduct more research to exploit its potential? In summary Nic’s book is part anecdotal, part scientific. It’s not a text book for knotweed aficionados but a useful publication for homeowners who want to better understand what this strange plant is and why it’s so difficult to get rid of! We liked the layout/presentation and think anyone looking for an introduction to Fallopia japonica will find all they want and need right here! Fallopia japonica, or Japanese Knotweed, is a plant whose infamy leads to a lot of misinformation (dare I say fake news? ), misunderstanding and fear. This book from Nicholas Seal aims to provide clear understanding to the history, taxonomy and what you really need to know about this plant. Nicholas starts by telling us the history of this plant and how it arrived in the UK and Europe. It is a story that highlights how careful we have to be when introducing plants from their native environments. No one realised at the time just how invasive this plant would be. It can reproduce by seed in the right environment and also by underground rhizomes. These roots can run and run and push their way through the smallest weakness in concrete and between paving slabs. Once it has taken hold it is very difficult to eradicate. Actually saying 'very difficult' is an understatement. Nicholas finishes the book by trying to cheer us up by giving us some good uses of the plant, including the fact that the young shoots are edible. This is a very interesting book about a challenging subject for us gardeners. Nicholas is an environmental scientist and the managing director of a company that eradicates Japanese Knotweed. He is a recognised expert on this subject so you can understand why it is a subject that he is knowledgeable and keen to inform people about. I liked the book, it is well written and beautifully (and usefully) illustrated. I now know a lot more about Japanese Knotweed than previously. I’ve yet to meet a gardener who doesn’t have at least one problem weed. I have several with horsetail (Equisetum arvense) chief among them. But even this is a walkover compared with Japanese knotweed. Vigorous and seemingly indestructible, it is regarded by many as the root of all evil . Yet, as Nicolas Seal shows in Japanese Knotweed, Unearthing the Truth, it’s only part of the story and there may yet be a use for this foreign invader. Seal, founder of Environet UK Ltd, which specialises in dealing with Japanese knotweed (Fallopia japonica), wrote the book to set the record straight . The result is a comprehensive look at the history of the plant, its botanical make-up, how to identify it and what to do, if you’ve got it in your garden. Japanese knotweed is an herbaceous perennial that’s thought to date from 125 million years ago on Mt Fuji in Japan. It arrived in Europe in the 1840s thanks to Philipp Franz von Siebold, a German physician and planthunter, although Seal makes a case for its migration also being due to the use of soil as ballast in trade ships. Either way it soon gained admirers, winning a gold medal in Utrecht and appearing in many of Gertrude Jekyll’s designs. In fact, it was sold commercially until a ban under the 1981 Wildlife & Countryside Act. By then, Seal tells us, it was too late and Japanese knotweed was already making its mark, colonising ground at the expense of native plants and damaging property. Homeowners are now legally obliged to declare the presence of the plant when selling a house and allowing it to spread to a neighbour’s land can leave you open to legal action. Its success is due to the plant’s sheer efficiency. 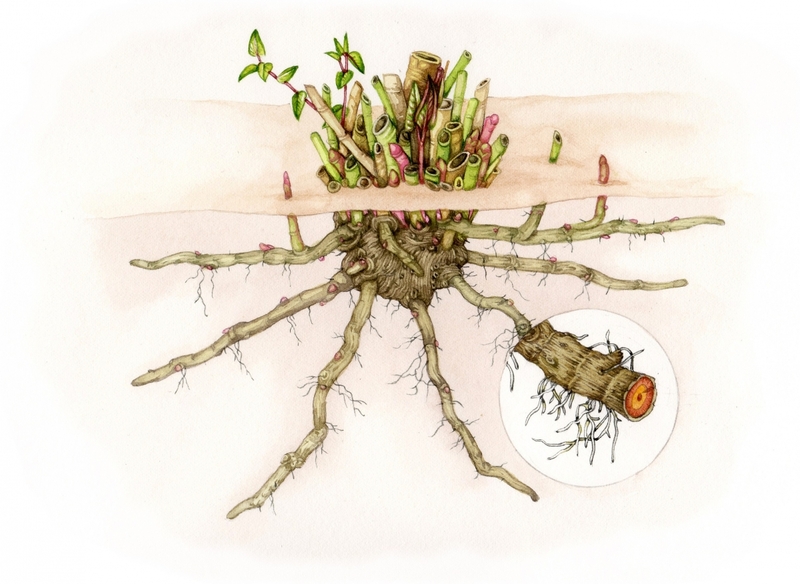 Rhizomes can lay dormant for 20 years and will then grow from a piece as small as a fingernail, while the fact they are brittle means they will easily break into pieces if the ground is disturbed. Add to that the fact that Japanese knotweed has more photosynthetic material per sqm than nearly any other plant and that it has developed a bio-chemical that slows growth in neighbouring plants and it’s hard not to have a sneaky admiration for it. It’s clear that Seal, an environmental scientist and expert on Japanese knotweed, is not among those who completely condemn the plant: . . . Japanese knotweed is only a weed when it’s found growing in the wrong place. In other situations, it might not only prove harmless and beautiful, but might even have a future value. That value might be in medicine – it’s been used in traditional Chinese medicine for centuries –as a fodder crop, biofuel or even as a way of cleaning up polluted ground. I’m confident that Japanese knotweed will one day be considered biological-gold, he says. Regardless of this plant’s future, its history is a warning of the dangers of neglecting biosecurity.